E. Kinne-Saffran and R.K.H. 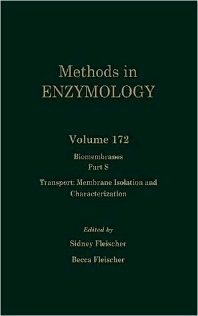 Kinne, Membrane Isolation: Strategy, Techniques, Markers. A.K. Mircheff, Isolation of Plasma Membranes from Polar Cells and Tissues: Apical/Basolateral Separation, Purity, Function. S.M. Goldin and S.C. King, Transport-Specific Fractionation for Purification of ATP-Dependent Ca2+ Pumps. Q. Al-Awqati, Regulation of Membrane Transport by Endocytotic Removal and Exocytotic Insertion of Transporters. H. Rottenberg, Proton Electrochemical Potential Gradient in Vesicles, Organelles, and Prokaryotic Cells. J. van Adelsberg, J. Barasch, and Q. Al-Awqati, Measurement of pH of Intracellular Compartments in Living Cells by Fluorescent Dyes. A.A. Eddy, Use of Carbocyanine Dyes to Assay Membrane Potential of Mouse Ascites Tumor Cells. J.C. Freedman and T.S. Novak, Optical Measurement of Membrane Potential in Cells, Organelles, and Vesicles. O. Eidelman and Z.I. Cabantchik, Fluorescence Methods for Continuous Monitoring of Transport in Cells and Vesicles. D. Ammann and P. Caroni, Preparation and Use of Micro- and Macroelectrodes for Measurement of Transmembrane Potentials and Ion Activities. H. Garty and S.J.D. Karlish, Ion Channel-Mediated Fluxes in Membrane Vesicles: Selective Amplification of Isotope Uptake by Electrical Diffusion Potentials. J.R. Blinks, Use of Calcium-Regulated Photoproteins as Intracellular Ca2+ Indicators. A.V. Somlyo, H. Shuman, and A.P. Somlyo, Electron Probe X-ray Microanalysis of Ca2+, Mg2+, and Other Ions in Rapidly Frozen Cells. R. Tsien and T. Pozzan, Measurement of Cytosolic Free Ca2+ with Quin2. H.G. Hempling, Analyzing Transport Kinetics with Desk-Top Hybrid Computers. J.W. Walker, G.P. Reid, and D.R. Trentham, Synthesis and Properties of Caged Nucleotides. H.S. Chase, Jr., M.D. Gelernt, and M.C. DeBell, Measurement of Ion Fluxes in Membrane Vesicles Using Rapid-Reaction Methods. U. Hopfer, Tracer Studies with Isolated Membrane Vesicles. D.S. Cafiso, Electron Paramagnetic Resonance Methods for Measuring pH Gradients, Transmembrane Potentials, and Membrane Dynamics. H. Murer, P. Gmaj, B. Stieger, and B. Hagenbuch, Transport Studies with Renal Proximal Tubular and Small Intestinal Brush Border and Basolateral Membrane Vesicles: Vesicle Heterogeneity, Coexistence of Transport Systems. H. Ruf, Y. Georgalis, and E. Grell, Dynamic Laser Light Scattering to Determine Size Distributions of Vesicles. R.S. Kaplan and P.L. Pedersen, Sensitive Protein Assay in Presence of High Levels of Lipid. L.G. Herbette and J.K. Blasie, Orienting Synthetic and Native Biological Membranes for Time-Averaged and Time-Resolved Structure Determinations. E.S. Kempner and S. Fleischer, Radiation Inactivation of Membrane Components and Molecular Mass Determination by Target Analysis. J.W. Shiver, A.A. Peterson, W.R. Widger, P.N. Furbacher, and W.A. Cramer, Prediction of Bilayer Spanning Domains of Hydrophobic and Amphipathic Membrane Proteins: Application to Cytochrome b and Colicin Families. M.P. Heyn, Order and Viscosity of Membranes: Analysis by Time-Resolved Fluorescence Depolarization. T.M. Jovin and W.L.C. Vaz, Rotational and Translational Diffusion in Membranes Measured by Fluorescence and Phosphorescence Methods. Y. Hayashi, H. Matsui, and T. Takagi, Membrane Protein Molecular Weight Determined by Low-Angle Laser Light-Scattering Photometry Coupled with High-Performance Gel Chromatography. M. Zulauf, U. F~adurstenberger, M. Grabo, P. J~adaggi, M. Regenass, and J.P. Rosenbusch, Critical Micellar Concentrations of Detergents. R.H. McCluer, M.D. Ullman, and F.B. Jungalwala, High-Performance Liquid Chromatography of Membrane Lipids: Glycosphingolipids and Phospholipids. M.P. Heyn, Circular Dichroism in Determining Secondary Structure and State of Aggregation of Membrane Proteins. H.G. B~adaumert and H. Fasold, Cross-Linking Techniques. J.V. Staros and P.S.R. Anjaneyulu, Membrane-Impermeant Cross-Linking Reagents. J. Brunner, Photochemical Labeling of Apolar Phase of Membranes. Biochemists, cell biologists, microbiologists, pharmacologists, biomedical scientists, biophysicsts, analytical chemists, and physiologists.